We’ve written often about common uses for our polystyrene plastic boxes, from winter holidays to springtime gifts, spanning industries from retail to sports, electronics and more. But the rigid, clear boxes that we manufacture have many specialized uses, too. One of the unique applications for our boxes is in the medical field, specifically for laboratories that manufacture and distribute high-end, sensitive specialty equipment. 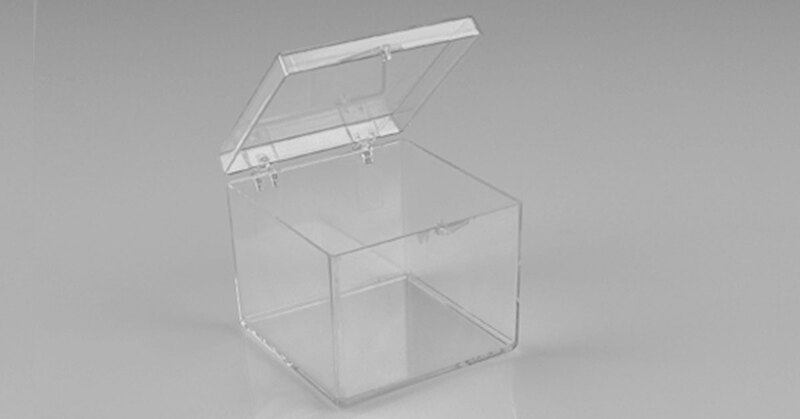 These are examples of the options they choose and why our hinged plastic boxes are ideal for shipping and safeguarding some of the most delicate, and valuable, components in the industry. Manufacturers of laboratory components for the medical industry know how important it is to protect these vital products. The tiniest chip, ding or dent can go unnoticed yet compromise and destabilize results for customers down the road. Packaging for laboratory components is more than simply practical – it is key in assuring that the products that affect healthcare outcomes are delivered to their end destination flawlessly. Our rigid plastic containers are ideally suited to protect sensitive parts including optical elements like lenses, dielectric mirrors, filters, prisms and more. Our G1400 series is the most popular option for optics and lenses, and come in a variety of heights from 1/2 inch to 3 7/8 inches to accommodate a range of products. Our 1×1 and 2×2 hinged boxes are also popular and are available in multiple heights depending on your needs. The hard plastic keeps components safe, while the crystal clear nature of the boxes makes it easy to see contents without obscuring them. Hinged boxes are especially beneficial because they comfortably snap open and closed without the risk of dislodging components inside. Where a box without hinges poses a risk that the item may be ejected if the lid is pulled off too forcefully, hinged boxes make it easy to open lids and remove items safely. With the price points of some of these specialty components ranging from hundreds to thousands of dollars for a single two-inch mirror, for example, it’s easy to see why the right box is so important. Rigid plastic boxes are ideal for protecting products during shipping, too. As an added benefit, the square and rectangular shapes make them easy to stack and store, cutting down on shipping costs and saving on storage space. For environmentally conscious companies, our boxes are also reusable and recyclable, making them a good choice for saving money and keeping them from landfills. 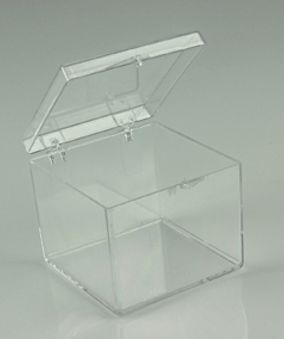 You can visit our full line of hinged plastic boxes here. With their smooth, crystal clear surfaces, our boxes are perfect for custom imprinting. Add your logo, artwork or design in any standard color with pad printing, hot stamping or silk screening. Hot stamping can also be used for gold or silver foil. Learn more about custom imprinting options here. If you need foam inserts, we have a variety of options including ether foam, ester foam and anti-static foam. We can also custom die-cut and size foam inserts to work with your requirements. For sensitive laboratory components, we find that our customers prefer to design and produce their own inserts. Our boxes are versatile enough to be custom-fit with the insert of your choice. Thermoformed plastic clamshell inserts are a popular choice among our medical customers because they are ideally suited to keep components protected and dust-free. At Gary Plastic Packaging Corp., we understand that laboratories and medical customers have timely and specific needs. That’s why we are committed to a continuous production schedule for the boxes that our customers require most, so that they can fulfill their obligations to their customers. We also provide volume discounts so if you have a question about how we can provide your medical lab with rigid, hinged plastic boxes for the protection, storage and shipping of your products, contact us online or call our New York manufacturing facility at 718-893-2200. We’re available to work with you and provide for all of your plastic packaging needs.